As National Novel Writing Month, otherwise known as NaNoWriMo, gets into full swing this week, I thought it might be nice to review some of the options out there for kids who love to create lots of words—poetry, short stories, nonfiction, and yes . . . novels! I’m reminded every day that we live in a sort of golden age for young makers of all kinds, including writers. Kids can create their own blogs for free, and even produce books for their friends and family almost for free. They can review books and share their own work via YouTube, Facebook, Wattpad, and other social channels for creators. Last year we talked about the Austin Public Library Foundation’s Badgerdog writing program, and we really can’t recommend those folks highly enough for their amazing summer workshops and other events throughout the year. This month, the library is holding NaNoWriMo workshops on Wednesday evenings at the drop-dead gorgeous new Central Library, and for younger kids, they’re sponsoring a songwriting workshop on Saturday, November 11, at Twin Oaks Branch Library. Details about both are here. 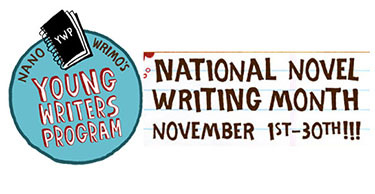 As for the elephant in a room of its own: the nonprofit Young Writers Program (YWP) is sponsored by the folks who bring the world NaNoWriMo every year. Kids and teens set their own writing goals, often along with a teacher or mentor. Some ambitious young writers over 13 choose to join the adult NaNo community and shoot for the full 50,000-word goal. Both kids and teachers have plenty of tools available, including workbooks that help with character building and plotting, prompts, and community events. Author superstars, including John Green, Daniel José Older, and Jenny Haan provide inspiring pep talks. Some of my best blogging friends have come from NaNoWriMo, and we keep in touch to this day. It’s hard to go into something like this alone, especially if it’s your first year. When you sign up, if you sign up, poke around the forums for people who are attempting this for the first time. Strike up a conversation, ask the experts for advice. They’re more than happy to help a newbie out. The amazing 826 Project is a national nonprofit that celebrates “the power of young voices, the possibility in their ideas, and the value of their words.” Long a community-based project with groups in seven big cities, 826 is affiliated with Austin Bat Cave but does not have an official presence in Austin. We talked about the valuable programs Austin Bat Cave provides for young Austin writers earlier this year, and we encourage everyone to check them out. In addition, the 826 Project recently added a rich digital component to reach more kids, parents, and communities—and this may be especially helpful for homeschooling parents or parents who want to supplement their kids’ school experience with more writing opportunities. Smells like melted mozzarella cheese. dripping on the side of the plate. The pepperoni smells like spicy wasabi. the dough peeking out the side. looks like a long snake. when I get presents from Santa. and the cheese is like a gray tiny rock. goteando de un lado del plato. El pepperoni huele como wasabi picoso. la masa asomándose del lado. feliz como cuando recibo regalos de santa. el queso coma una roca pequeña color gris. You can comment quite a lot on people’s individual chapters. . . . The people who bother to comment are the ones who love it. . . . If you don’t love it, you’re probably not going to say anything. Another recent episode of Mom Writes discussed how young writers can use fanfiction to improve and distribute their writing. The guest was Michelle Hazen, who advocates for the creative power of fanfiction. Go Teen Writers is a blog (plus Facebook community) that offers teens helpful tips, general encouragement, and a way to share ideas. It’s run by three published authors and writing coaches who clearly enjoy connecting with young people. They’ve written a book, also called Go Teen Writers, about how teens can go from first draft to published book. Are your kids in search of real-life instead of online comrades for their writing adventure? In Austin, Recycled Reads Bookstore, which is affiliated with the public library, holds “write-in” events on Saturdays and welcome kids, teens, and adults for a little community and discussion after the writing is done. So pack up your crayons, pencils, or laptop, and let’s go write!